Leasing and buying are the primary ways landscape contractors add to their fleets, but don’t forget about renting. Here are some pros and cons for each option. +Pro: Residual or resale value. You can trade it in down the road to offset the cost of the next equipment you buy. +Pro: Asset depreciation reduces your tax obligation. +Pro: Financing is an option, but cash purchases eliminate finance charges and interest costs. -Con: Payments are generally high because you’re paying for the full value of the equipment. +Pro: Payments are generally lower because you’re only paying for the use and depreciation of the machine. 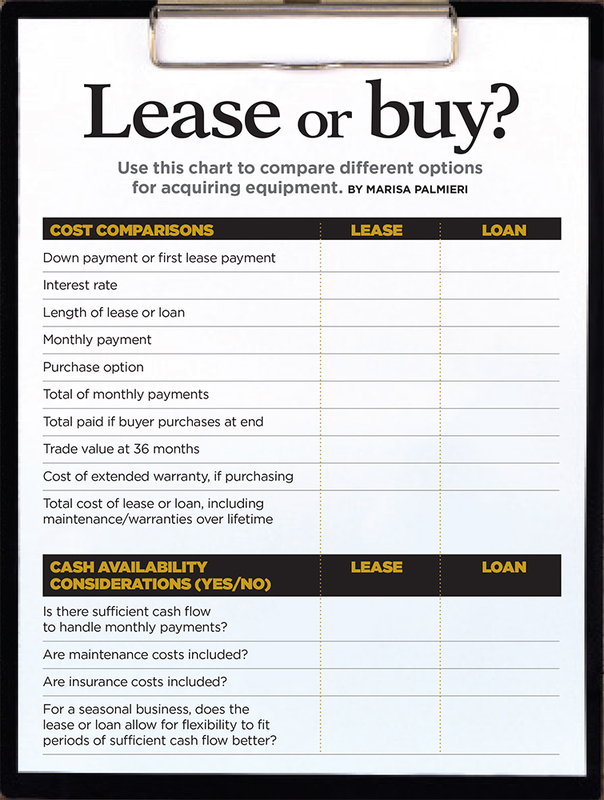 Some leases allow for skipped payments during slow months. +Pro: No down payments, so it’s easier to replace aging equipment with minimal capital outlay. +Pro: Helps structure a schedule for replacing equipment before maintenance costs become too expensive. -Con: Lease agreements can be complex, heavy on fees and unbreakable, which increases the risk for companies. +Pro: It provides access to equipment you need occasionally. +Pro: It allows you to try a machine before you buy it. +Pro: Users typically aren’t responsible for maintenance costs. -Con: Daily or weekly rental costs may be high. Remember to figure them into your job costs. Download a PDF of the checklist here.